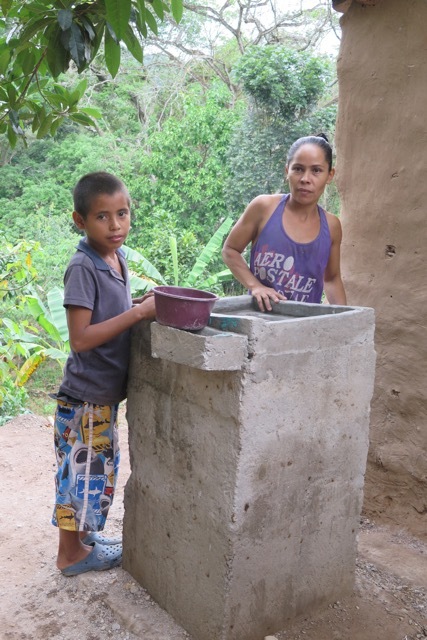 Byron Bueso, age 13, learned how to build improved stoves and sinks at workshops in a nearby community. Within a short time he built others in his own community. 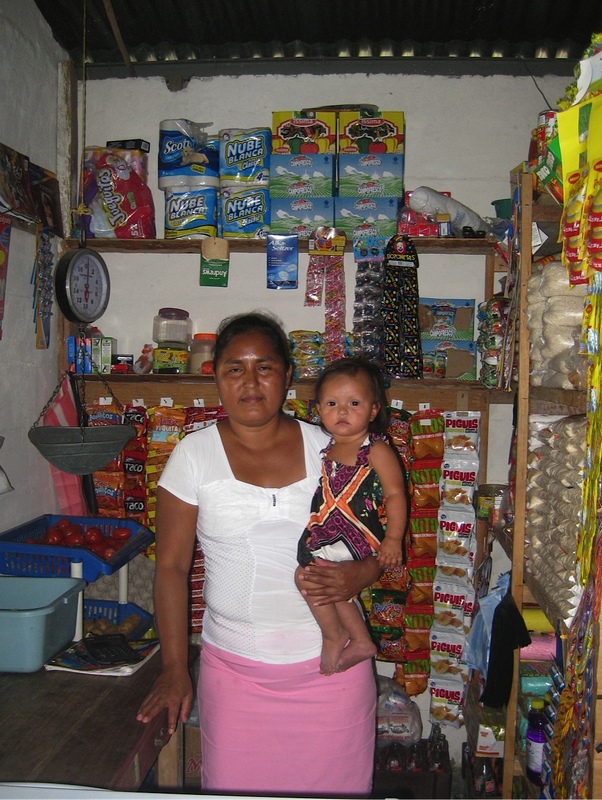 Mercedes Rios, shown in the small store she runs in her house, liked helping other families learn how to build wood-conserving stoves. 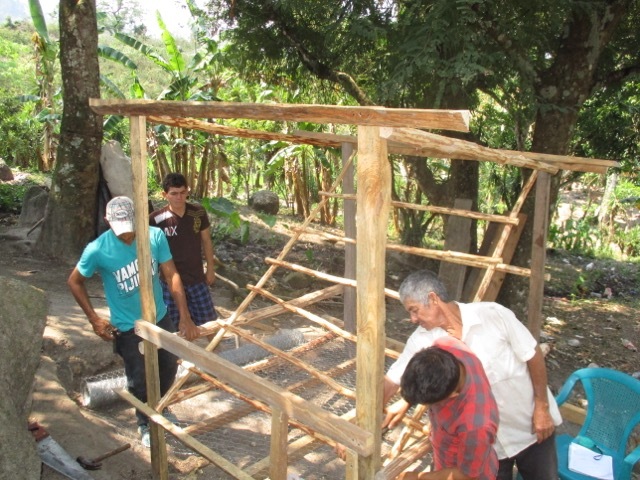 The first chicken coop in Aqua Zarca is being built by a farmer from El Cablotal, Antonio Gamez. 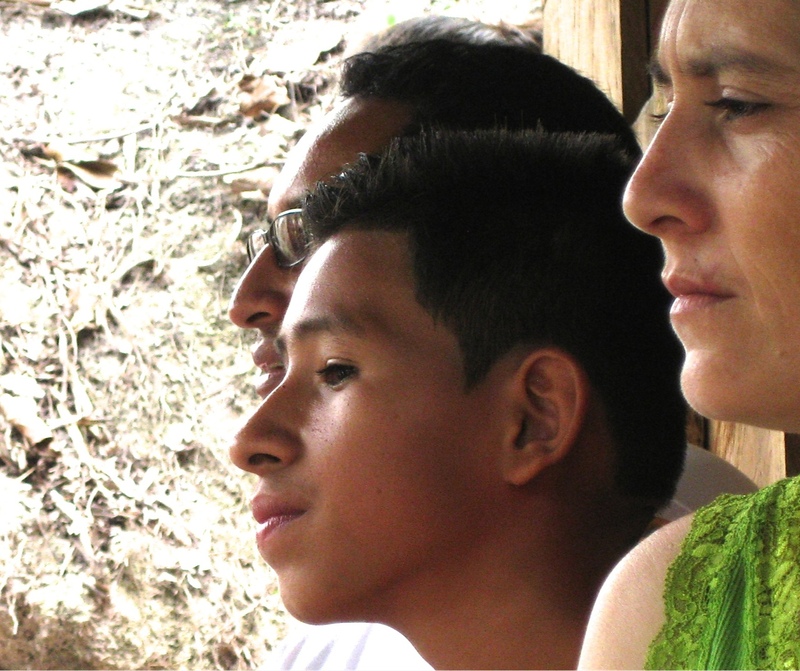 These coops protect the hens and eggs, thus benefitting family nutrition. To scroll through blogs, click Blogs on top menu. 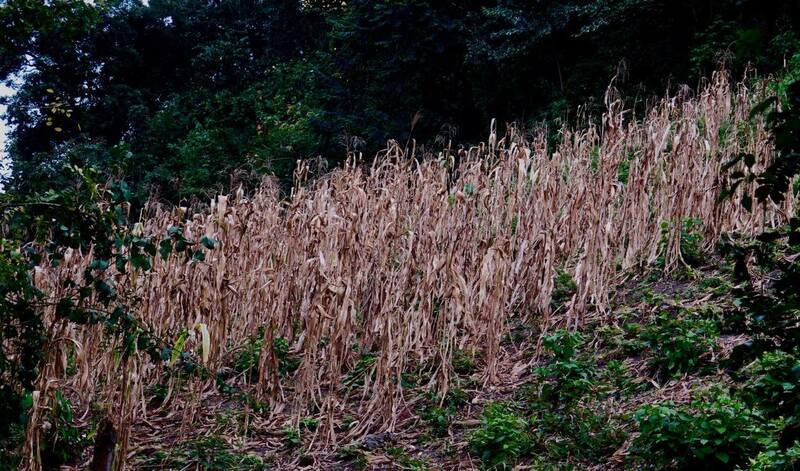 Many corn fields planted in December 2015 failed because of drought. Families are counting on the traditional May-June rains for the September harvest. 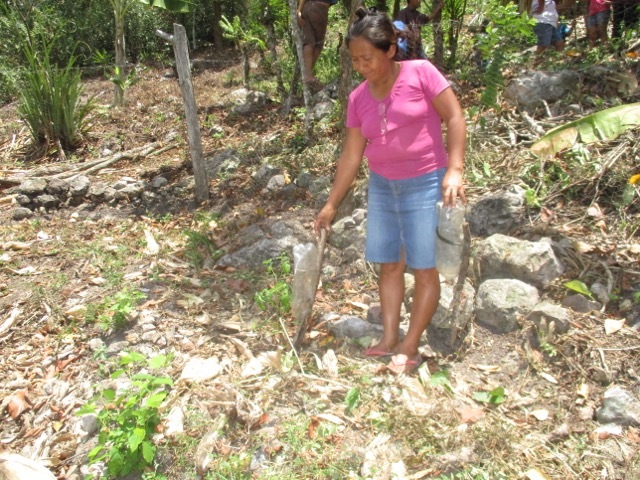 The new owner of a water-conserving sink shows where the filtered water drains out of the bottom and into her garden. 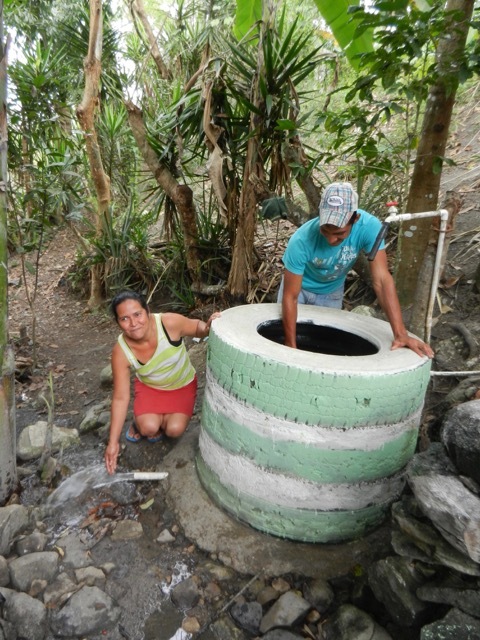 Used to carrying all the kitchen water for family use uphill, Altagracias Peña is grateful for this water-conserving sink which filters the wastewater and drains it into a new nearby garden. 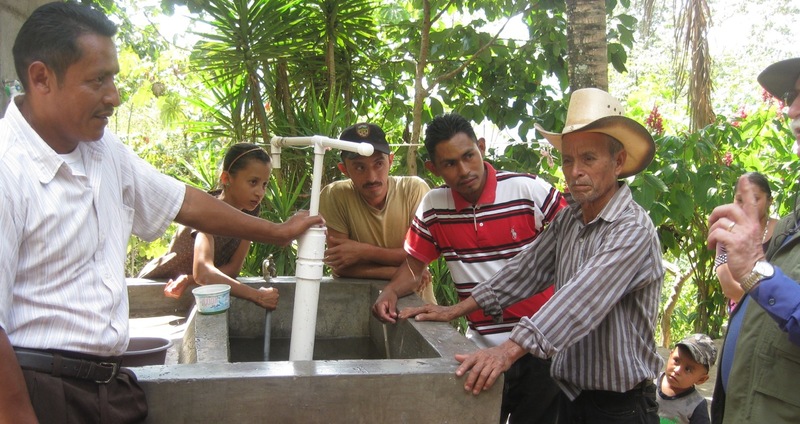 Farmers of El Cablotal take a keen interest in the flex-pump that can shoot water a far distance. 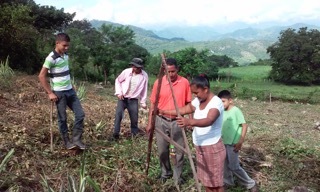 Pastor Rios (holding the pump) plans to take what he is learning to his church members. A new participant, Maria Vasquez provides crip irrigation to her cacao seedling using a plastic bottle with pin holes in the cap. 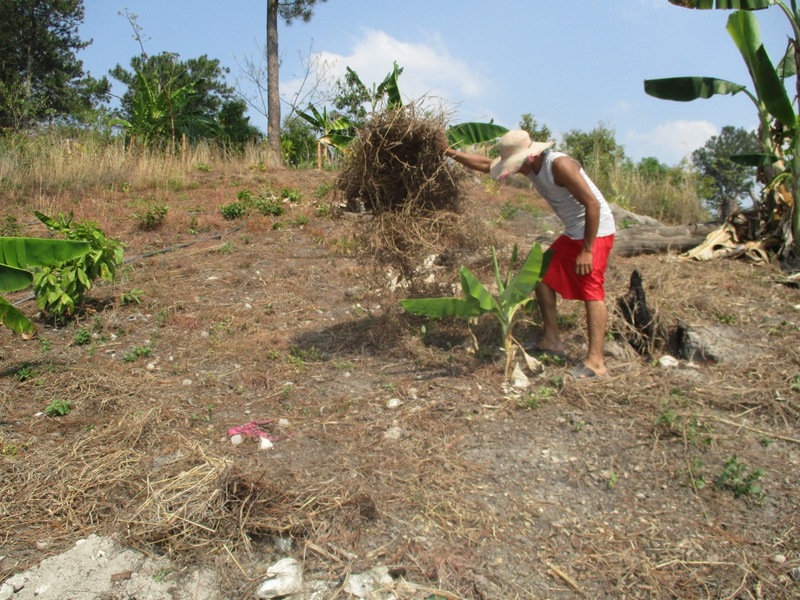 A farmer inspects his banana plants, yuca, and squash to assess the soil moisture beneath the mulch. 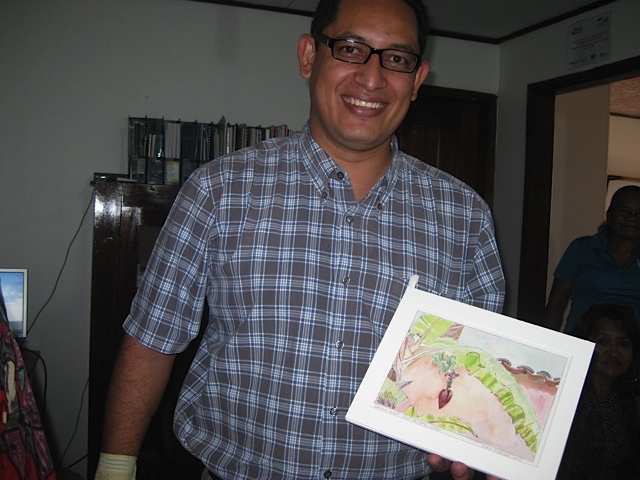 Edwin Escoto with a painting of a plantain by Mary Procter. During the trip we learned that Edwin believes art has the potential to be an important element of the Vecinos program to encourage self-awareness and empowerment. Unfortunately there isn’t have much funding for it. Mary and Bill hope to share ideas from some of the projects TCP travelers have led during past trips to the TCP communities. 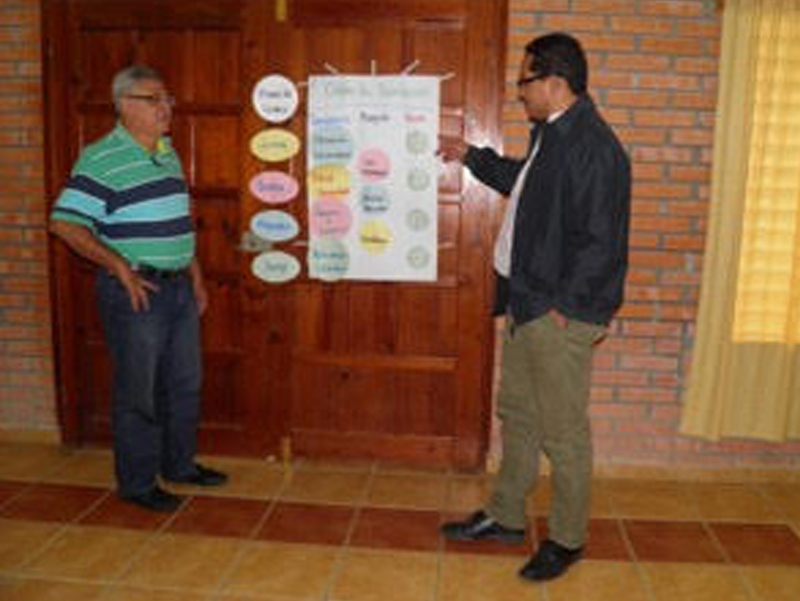 Roy Lara, left, with Edwin Escoto, right taking part in a Vecinos Honduras staff meeting. During a visit in to Washington DC in 2015 Edwin explains how other VH staff members will work for short periods in the TCP communities. In early 2016 two staff members led workshops on nutrition, building improved stoves and sinks, and planting vegetable gardens. 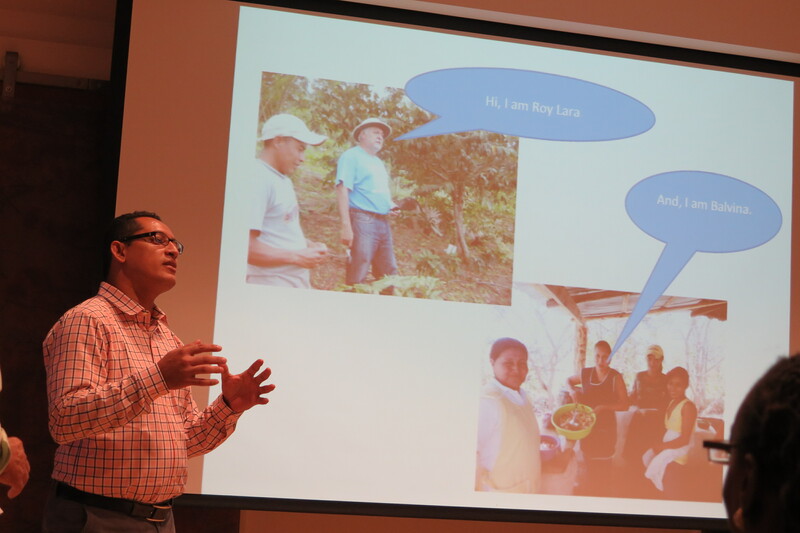 Edwin Escoto explains how the Vecinos Honduras program expands into neighboring communities. 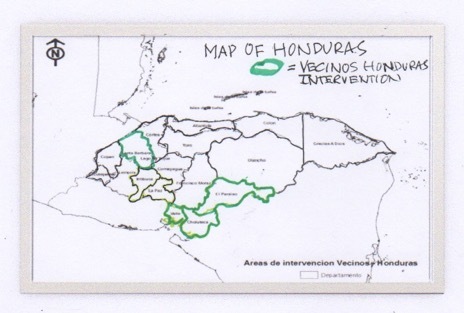 Vecinos Honduras currently operates in the three departments (states) in southeastern Honduras. The Trinidad Conservation Project is in the western department of Santa Barbara. 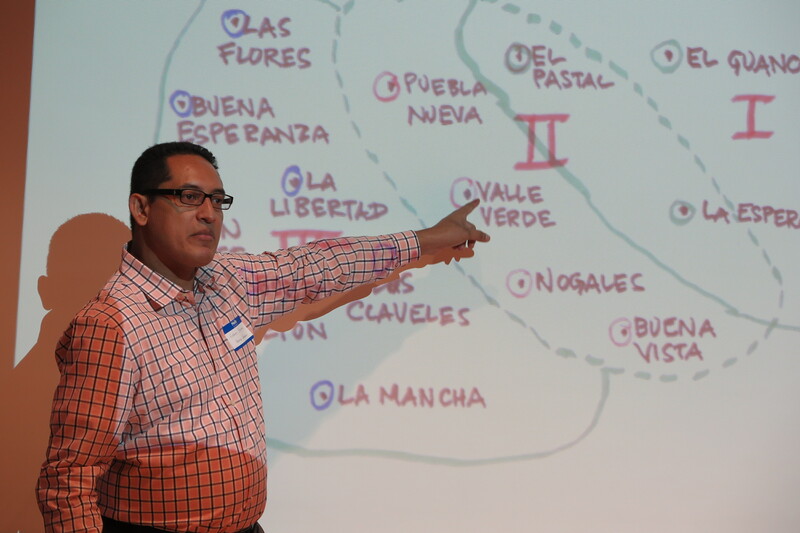 Including TCP was an act of vision by Edwin Escoto.